Colin & I wanted to say a big thank you for all your help in getting our caravan fixed. It is so important to us to have a good dealership to rely upon. 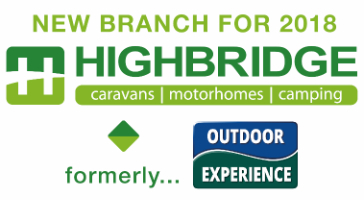 We have renewed faith in the Devon Highbridge...we hope we don't see you too often but are glad that you are there when we do. 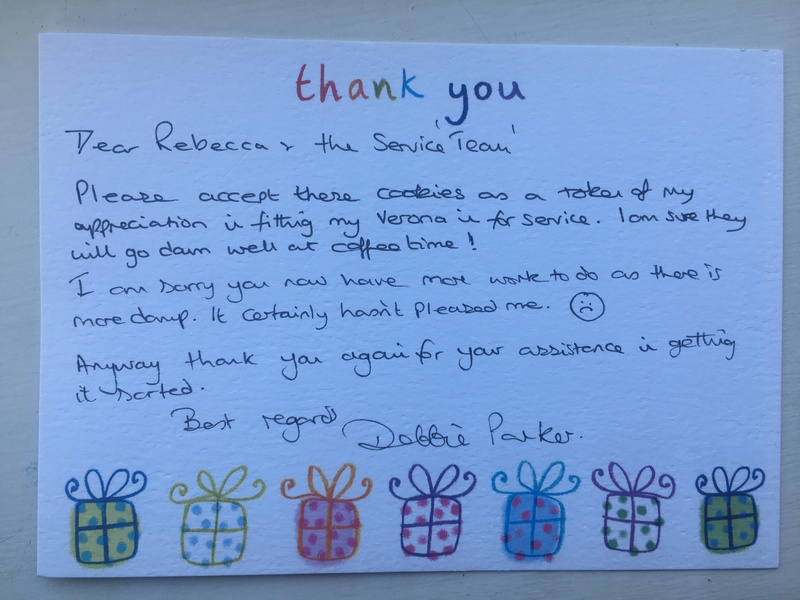 Thank you... Dear Rebecca + the Service Team, Please accept these cookies as a token of my appreciation in fitting my Verona in for service. I am sure they will go dam well at coffee time! I am sorry you now have more work to do as there is more damp. It certainly hasn't pleased me. :( Anyway thank you again for your assistance in getting it sorted. Best regards, Debbie Parker. Thank you so much for fabulous service in buying our new to us motorhome. Thanks to Jody White for sorting the deal and helping us to find the right van for us. We've dealt with Jody in the past and he's as honest and helpful as always. The handover was fabulous and Jaki was very helpful and knowledgeable and gave us a very smooth and helpful handover. All the staff were very polite and helpful. And we even got a night at a local campsite to check everything and settle into the motorhome. Thank you again for a beautiful motorhome and we we're especially pleased with all the extras and work that had been done pre delivery. Hi, I need to tell you about the excellent service I received from Rebecca when I had a problem with the remote control for the mover on my caravan whilst away in Cornwall. She contacted the supplier and arranged for a replacement controller to be sent to me as soon as I got home. All was done without me being aware of what she had done until it had all been arranged....excellent service and so thoughtful. Best wishes. Colin Dawe. Big thanks to Chris F in after sales for going the extra mile in his outstanding service to me. We bought a new van from you in Dec 2017,we live 300 miles from you, I was nervous in case we had any issues when we first started to use it. Well we had a few issues,added to the issues were the time pressure of us being booked on a Ferry to Spain on Sunday the 4th Feb...I have given myself 5 days to get to grips with the new van. Having worked for the Virgin group of companies where service to customers is driven right from RB himself,it was refreshing to find another company where a member of their staff took great care.expertise,understanding and empathy with my issues . Chris..was attentive,knowledgable, and patient ...and most importantly delivered solutions to my issues , always reminding me that his aim was to get me on the ferry for the start of my holiday today. I' m writing this at the ferry port. Your great customer care ,delivered to me over the last few days had made me an ambassador for your company. Thank You. I would like to place on record how helpful one of your staff have been over my purchase of a Rapido 9090 df motorhome. I only know him as "TERRY" in after sales. He is always keen to answer all sorts of initial problems, come up with answers, and has been especially knowledgeable over a windscreen wiper problem on my motorhome. Ref: After Sales Team... Please convey my sincere thanks to the team in the way they dealt with my recent warranty issues. They are without doubt the most proactive team I've had the pleasure to come across. These people will often get unhappy customers through the door so deserve recognition for their friendly helpful manner. One smiley contented customer.